Read message files in Different Views like Header, Hex, Properties etc. 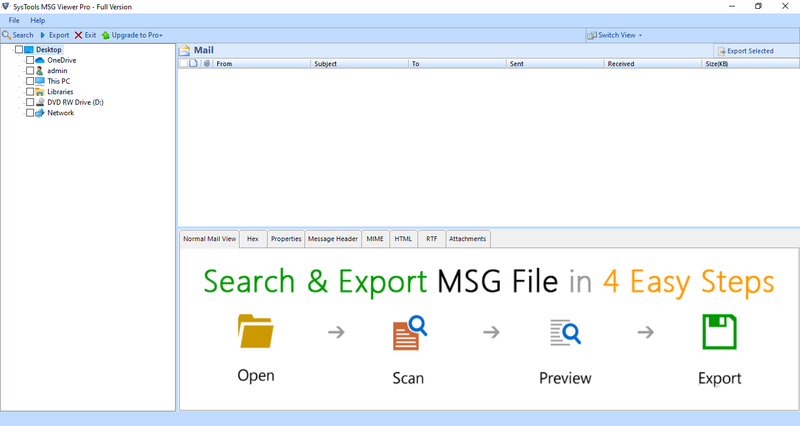 The MSG files to PDF Converter gives an opportunity to view emails of MSG file along with their attachments in single interface. MSG emails along with their properties like sender, receiver, date, time, size etc can be viewed using the tool to batch convert MSG to PDF. The MSG File to PDF converter provides the option to convert msg files to pdf with attachments. Messages along with their attachments will get saved into their inherent file type. For every mail, an individual PDF file will be created by the .msg to PDF Converter Tool. The software save MSG file as PDF allows viewing and analyzing MSG mails through normal, attachments, header, properties, MIME, HTML, and RTF view. All this information will be available corresponding to every mail in the MSG file. 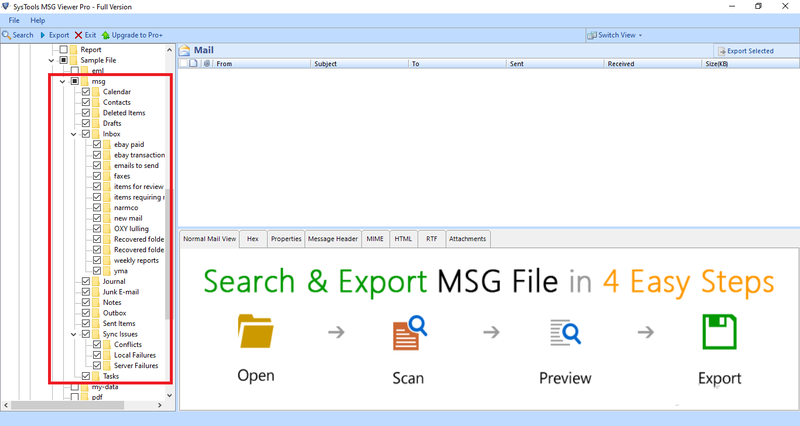 The tool to batch print MSG to PDF allows searching for particular email from the list of MSG files. The searching criteria can be subject of the mails, any keyword, or a phrase. Any searching criteria can be added to filter emails as required. Interface of the MSG file to PDF Connversion Tool is like Windows explorer and automatically locates the folder with MSG files within the machine. 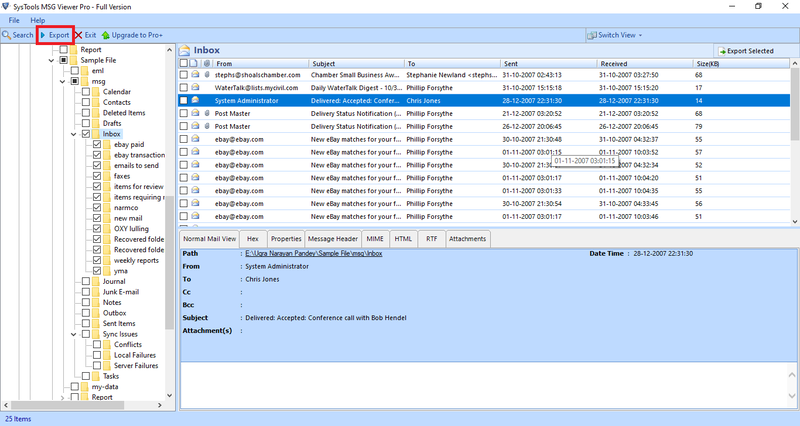 On the selecting the folder with .msg files, the software generates an instant preview of emails on screen. The software for converting MSG to PDF provides option to select MSG files that are to be exported to PDF file format. This way, the tool to batch convert MSG files to PDF gives the opportunity to export only important mails into PDF. If needed, all MSG files can be exported in batch. For sorting MSG emails saved as PDF, the MSG to PDF Conversion tool offers eight naming conventions. 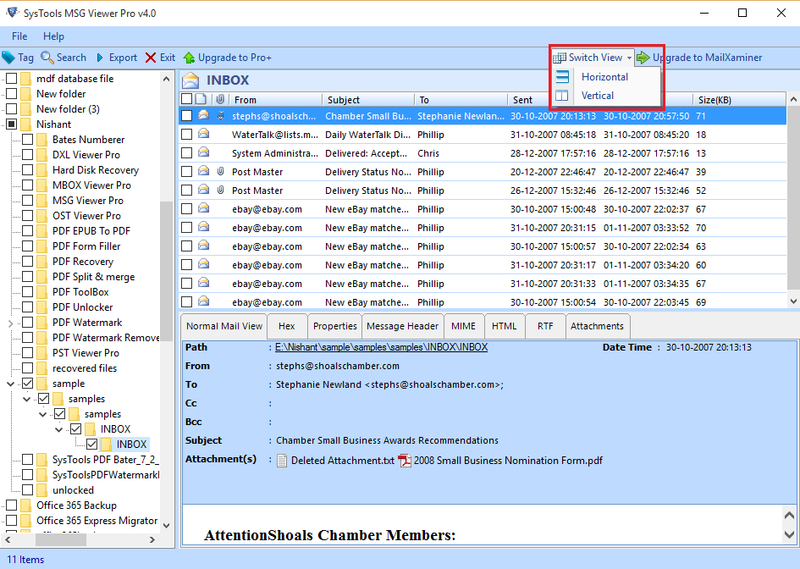 This allows managing emails by sender, subject, or date as per the users’ choice. Any of the relevant option can be chosen to name emails. The software to convert MSG files to PDF with attachments maintains on-disk folder hierarchy structure. Also, the tool only performs a read-only operation on the MSG files and saves the output in the form of PDF in a separate folder at desired destination location. Trial version of Pro don't support Search, Naming Option and Save & Convert MSG files to PDF Document. Can the software batch convert multiple MSG files to PDF? Yes, the software to convert MSG to PDF including attachments can very easily export MSG files to PDF in batch. Download and install MSG to PDF Converter Tool. Search & mass convert MSG File to PDF from the selected folders/drives. All the MSG files will be added as as per the folder store. The required files can be selected via the check boxes. Once the files are selected click on the "Export" button. The .msg to .pdf software will easily batch convert MSG files to PDF file format. How long the does the software to perform MSG to PDF conversion supports free version? You can enjoy the free version of software for converting .msg to PDf including attachments for as lifetime. 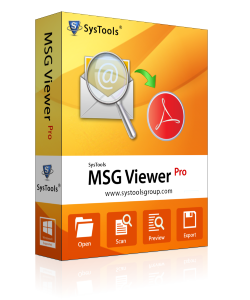 Is there any limitation to the number of MSG messages that a user can view using this tool to export MSG file to PDF. There is no limitation to the messages that you can view through PRO software. Does the application to print MSG to PDF Acrobat needs the installation Of Outlook. You can view & export MSG email to PDF without the installation of Outlook on your system. How to save .msg to PDF which I can view? To save the MSG files which you are viewing, you need to upgrade the application to its Pro version. The pro version allows users to convert MSG files to PDF with attachments. Can we get to view the attachments with MSG file to PDF Conversion tool? NO, you can only view the attachments with the software to save Outlook MSG to PDF. To save the attachment you need to upgrade to the Pro version then you can convert MSG files to PDF which is a paid one. Will MSG email attachments & email be saved into a seperate folder ? No, the software will export attachments of every email embedded within PDF in its native format. You can simply open attachments with its supported applications , like xlsx file with MS Excel , .txt with Notepad++ . Will this software merge all emails into a single PDF ? I have shifted from Outlook to Notes a year ago and needed to recover some old email information regarding my salary slips for my accountant from the outlook files. I was considering again buying Outlook 2007 and installing it to gain access and export MSG files to PDF. However, I came across your product MSG File to PDF Converter and decided to purchase it. The tool to batch print MSG to PDF really works out well. It does not require the installation of Outlook 2007 and automatically locates the MSG files. I am really thankful to you for developing such an app for converting .msg to PDF files. I wanted to access my bank statements from the MSG files. I was thinking of buying MS-Office and installing it. Nevertheless, the high price of Office 2010 did not convince me to do go for it. Finally, I tried searching for the application to convert MSG file to PDF Acrobat to read out the messages and I got your product MSG files to PDF Converter. It has given me the flexibility to read out the mails with the advanced search option .With this tool to convert .msg to .pdf without Outlook, I was easily able to locate the Bank statements from a number of messages.Morever; I was able to convert MSG files in PDF format. It is really a commendable solution.